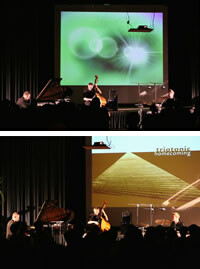 the music of triotonic is carried by emotions and atmosphere. this leads to associations with pictures and scenes among large parts of the audience. a vj improvises moving images and scenes to the music using laptop and beamer. multimedia artist johann steinecker, who was also involved in the cd "homecoming" and is therefore familiar with tritonic's music, has taken over the job. with a lot of intensity and tension the audience experiences the synthesis of two forms of art to one organic whole. this motto brings together top-class austrian trios from jazz and classical music to perform with each other to open new possibilities. turning an evening into a happening or festival. no matter whether performing along with bleu and drechsler or the haydn trio eisenstadt - the work of triotonic is always affected by both quality and originality.